→ Color: The color is SO nice!! One of the harder things about finding a wig for D.Va is finding that perfect mix of a warmer colored brown. Lots of brown wigs tend to be on the cooler side, meaning the tint of the brown is a bit more on the green side, giving the overall brown color a much darker feel. D.Va’s brown is a very soft, red-tinted brown and it’s hard to find that! 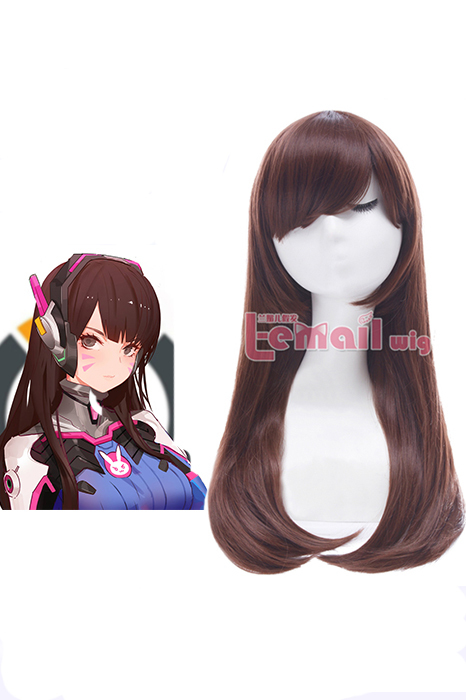 L-email Wig‘s brown coloring for their D.Va wig is PERECT and I honestly could not be happier with the color! → Texture: The wig fibers are very soft to the touch without sacrificing volume to the overall wig. I did some hair flipping tests and this is definitely a great wig for some action shots! The wig falls nicely without looking clumpy and getting tangled easily. It has a nice sheen to it which I really like, because it helps add a more graphic look to photos which lines up perfectly with Overwatch’s more cartoony aesthetic. → Style: The bangs on this wig come un-styled so you can cut them to your face shape! I’m not the best wig cutter/stylist, but had no issues in terms of trimming the bangs and having them fall back into their original placement, basically looking like the wig came trimmed already. Sometimes with straight fibers they can be hard to style and end up looking very choppy, but I didn’t have that issue with this wig! The ends have a slight wave/curl to them which is perfect for D.Va’s bouncier hair style. I think this wig would also serve as a great fashion wig! I can’t wait to wear it for things other than my D.Va cosplays! → Pricing & Shipping: The price of this wig is $12.88 USD without shipping! It’s very affordable for such a great quality wig! Shipping is varied based on your location. → Delivery: I received my wig in Virginia in about 2 weeks! The supplier is in China and I think that’s a very speedy delivery considering it’s destination. Sometimes suppliers from China can take up to 4 weeks but this arrived to my apartment in a timely manner. Overall I’m very happy with my D.Va wig from Wig Supplier! I look forward to trying out more of their wigs in the future 😀 In the mean time, check out the D.Va wig (http://www.wig-supplier.com/new-game-overwatch-dva-medium-l…) and their store (http://www.wig-supplier.com/). This entry was posted in Wigs and tagged anime cosplay, anime cosplay wig, best cosplay wigs, cheap wigs, cosplay ideas, cosplay wigs, fashion wig, fashion wigs, L-email wig review, L-email wigs, long wigs, straight fashion wigs, synthetic fashion wigs, wholesale wigs, wig maintenance and care, wig store, wig-supplier reviews, wigs.